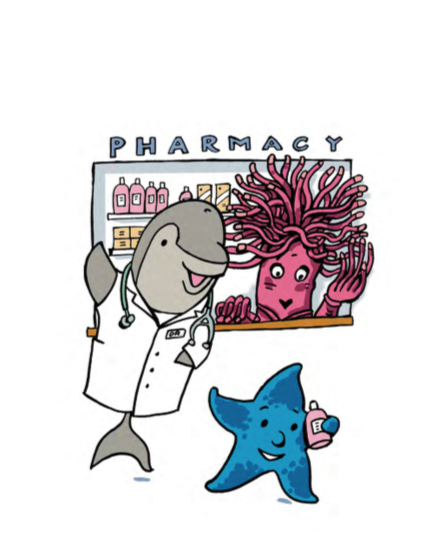 Sandy the Starfish meets Doctor Dolphin. A pre-schoolers book about an outpatient’s visit to hospital including having a blood test and visiting the pharmacy. Our Daughter Verity was diagnosed the Lupus (SLE) in January of last year. Her symptoms presented as swollen sore joints (like arthritis) and also with a very low platelet count. The low platelet count meant that at first the doctors had to rule out leukaemia, which we were very relieved about and we came out of the hospital dancing that Verity ‘only’ had SLE. Finally the true implications of living with a potentially life threatening disease sunk in, and we got used to the daily administration of drugs. However, the monthly blood tests that Verity had to have were far from becoming routine. They were awful. Action for Sick Children produce a leaflet to help the adult helper taking a child for a blood test advising you what to do – but, despite following their helpful hints Verity was still kicking, screaming, terrified of the procedure and in particular the tourniquet – not the needle! It was so out of character for her and I could see a true ‘flight or fight’ mechanism hit in, as she used every ounce of strength to try and throw off her adult assaulters. I then turned to reading story books. But the typical hospital visit they portrayed involved a broken leg, or spots, with the pain and hurt happening before hospital which the ‘nice doctor’ fixed. As far as Verity was concerned she was absolutely fine before visiting hospital where the very horrid Doctor hurt her and then she ended up with a plaster that she didn’t even want; evidence of the physical attack! Nor did any of these books portray the cyclic nature of monitoring and testing, assessing for correct drug levels slowly leading to a better state of health. So really I was at a loss as to how to help my child in the best way possible. The idea of the lift flap book as born, knowing how much very young children enjoy a game as part of the reading experience. Sandy the character came out of thinking about what Verity enjoyed best – summer holidays – fishing in rock pools and touch tanks at aquariums. I approached our local hospital and talked with the phlebotomist, play therapist, nurse specialist and consultants (whom we were all seeing regularly) and asked if they thought that the idea I was thinking of would work. Fired up by positive responses, aided by my husbands more adept rhyming skills I set out a story board and went to find a cartoonist and designer. I think you will agree that they have done a fabulous job in translating my ideas to paper. With the storyboard I approached a few children’s publishers, but it was too much of a niche market, a ‘painful’ tale and not really at all cuddly and got turned down. Determined that other children should benefit from Sandy we have set about self-publishing and are now at the stage of waiting for the books to come back from the Printers at the end of March – all very exciting! Also, we have been approaching organizations and businesses to sponsor copies of Sandy into their local children’s hospitals and wards, and GP’s surgeries. If you know of anyone who would like to purchase books, at cost price, to help young children with hospital visits in their area please don’t hesitate to contact us via this web-site.